Catblogging was a close call this week. But last night my sister told me that not only had I better get on the ball and take some pictures, but it had been a tough week and they’d better be good pictures. Well, I don’t know about that. But for better or worse, this morning we have cats exercising their brain muscles. 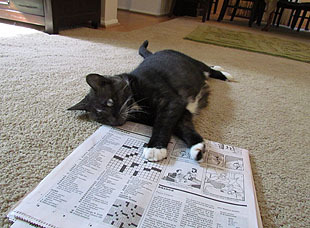 On the left, Inkblot is finishing up today’s Sudoku and Kenken puzzles in the LA Times. He seems to have made pretty good progress. 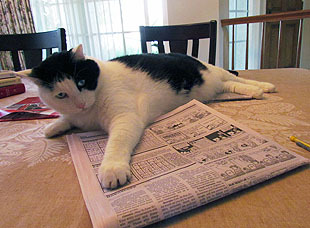 On the right, Domino is working on the crossword puzzle, but she doesn’t seem to be doing as well. I guess she got distracted by the cartoons.